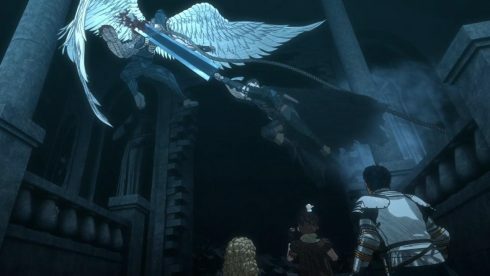 Berserk’s 2016 Anime series has been picking up steam for a while, but it was in this episode, that everything culminated into something truly impressive. This week’s episode, the ninth episode in the series, was the first episode where things were tense, superbly exciting, and even the CGI animation shined in its own unique way. This episode was just good, with immaculate pacing, a real sense of thrill and suspense, that was coupled with awesome character moments. Its episodes like this one, where a collection of grand moments and payoffs come together, that truly makes me wonder what Berserk could’ve done with an actual budget and some financial backing behind it. 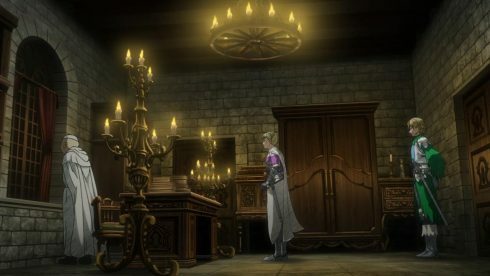 There were so many great looking moments, dripping with atmosphere and a look and feel that felt very original and wholesomely unique to this series and franchise. 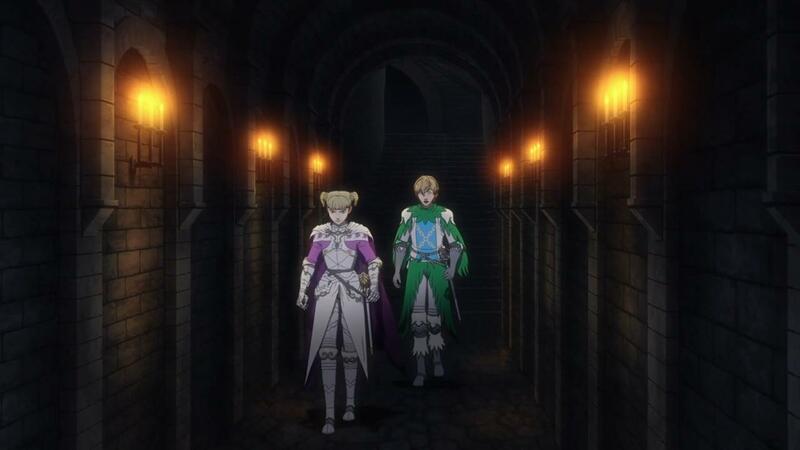 From the first scene in the episode, things looked better than they ever have. The scene with the Priest talking to Farnese and basically telling her that her father had asked her back, was creatively depicted. Sure, the hand-drawn frames themselves were fairly static, but the reflection of Farnese and Serpico in the window as the old man talked, was an artistic and creative touch that made the scene pretty engaging. It almost feels like the show is doubling down on impressive art direction, in order to make up for its lack of ability in actual animation. And what’s perhaps most strange, is that this little gambit is really starting to payoff. Berserk isn’t a fluid and well animated series, but its jaw dropping because it “looks” impressive. Excellent use of color, great lighting, impressive use of reflections and a sense of style combines high fantasy with macabre and horror, it all comes together perfectly. Plus, combining that great artistry with expert pacing and good story beats? That’s a recipe that makes this episode just exceptional. It makes it good enough to be called something truly special (And that’s why this episode has an A Grade, as far as I’m concerned). I mean, immediately following that creative scene where we not only learn that Farnese herself is being called back, but that its her father that’s making it happen, we get a heart to heart between her and Serpico in the hallway just outside. The beauty of both scenes, is that they not only advance the plot forward, but they key us into little nuggets of information in a very organic way. Through them, we learn a bunch of fairly notable things. 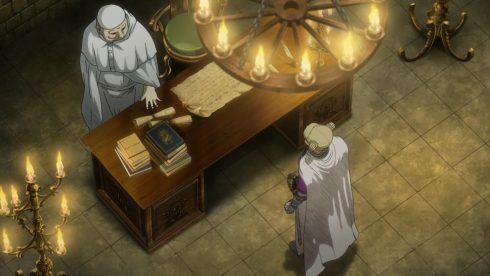 One, Farnese’s father definitely doesn’t approve of her Holy “missions” and it seems like there’s some serious tensions in the family. 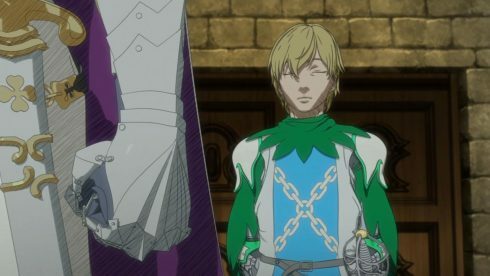 Two, it seems like Serpico is actually not only part of Farnese’s family, but that he actually actively keeps tabs on her and protects her under the direct orders of her father. Yet, it seems like there’s this complicated “master servant” relationship between Farnese and Serpico, with Serpico having “sworn his sword” to Farnese. The third and most ironic piece of information that we get in all of this, is that Serpico basically reports on Farnese’s activities to her father, this time, for her own good. 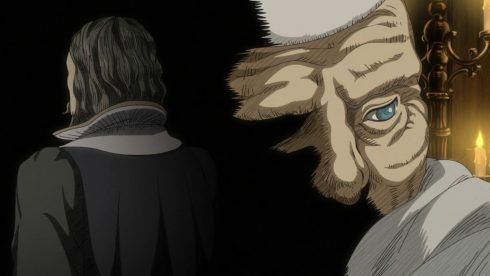 Its quite evident and clear that Serpico has some pretty deep feelings for Farnese, because he selflessly acts for her benefit. 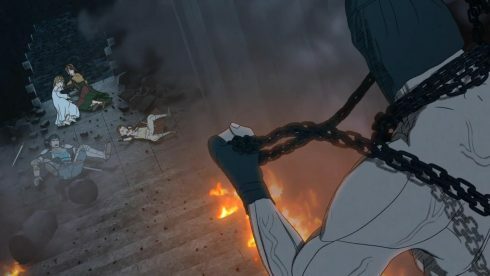 We saw him take on Guts last episode, and now he basically is trying to get Farnese away from the Tower, before it fundamentally changes her and ruins her. Serpico doesn’t have a lot of power or options, but he’s making the most of his situation and doing the best he can. 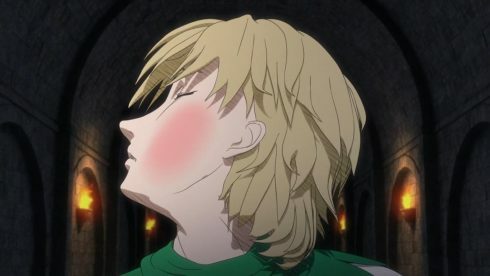 Farnese can’t see that, obviously, because she’s a pretty damaged and broken person already. She’s on this path where she runs away from her issues by acting in accordance with “the lord’s will”. 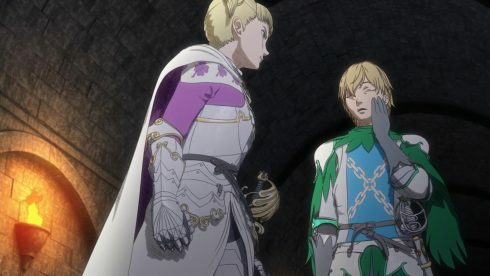 That’s clearly a fantasy though, but it just goes to show how naive, lost and confused Farnese really is, and how little she understands about what’s happening around her. Which I think, is where Guts comes in, quite literally at that. 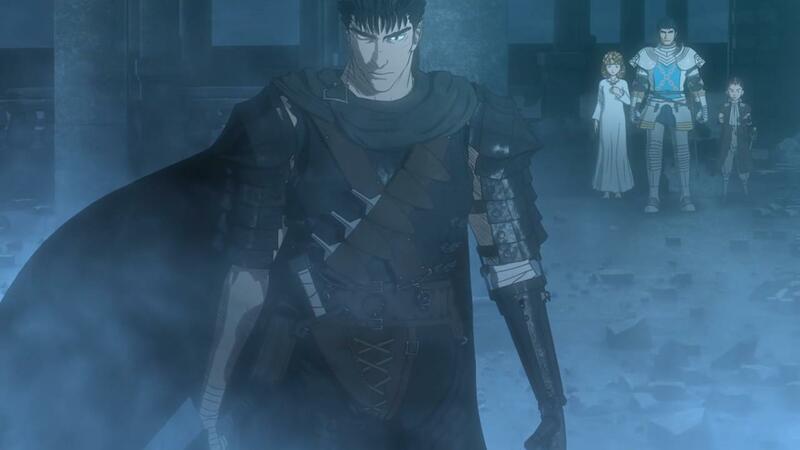 We see Guts finally infiltrate the tower, and the first person he runs into and uses to guide him, is Farnese. 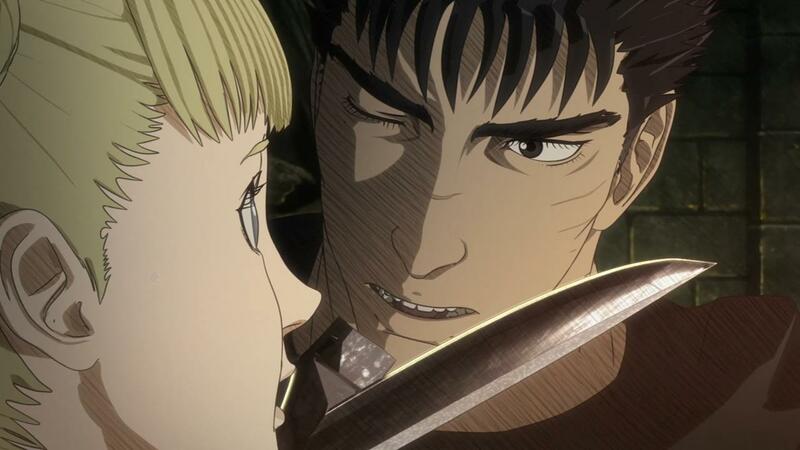 Guts is such an interesting thing that continues to happen to Farnese, because everything he does, continues to utterly and complete destroy her weird world view and built up fantasies. The world is a terrible place, and Farnese is supposedly supposed to be in the right. Yet, this so called “heretic” consistently saves her life, battles these otherworldly demons, and is looking to save someone, rather than you know, do something truly evil. 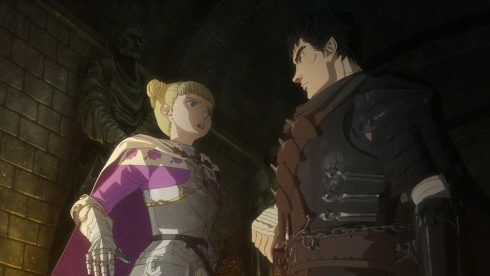 Every time Guts and Farnese interact, its just fascinating to see how much it riles Farnese up, and how much good it probably does for her. 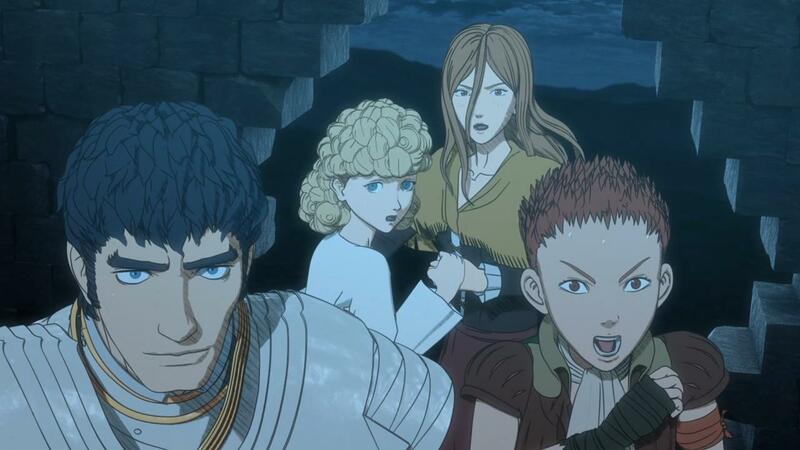 Of course, All Guts actually has Farnese do is show him the way to where Casca was last seen, in a the torture dungeon where a bunch of monsters appeared. 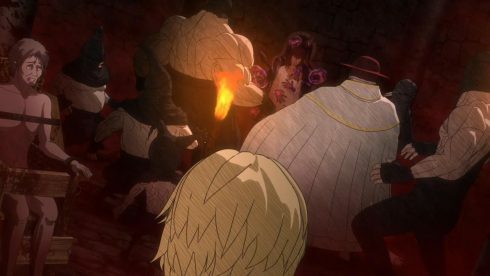 So the monsters… Its interesting to note that the monsters that appear in the torture chamber a bit earlier in the episode, are as alien to the High Inquistor as they are everyone else. The High Inquistor actually isn’t some kind of demon in disguise. He’s a rather abnormal human, that’s got such a warped sense of self and a righteousness that makes him perhaps, something truly twisted. He’s evil in a way that only a human can be, because of how misguided and warped his actions and beliefs are. 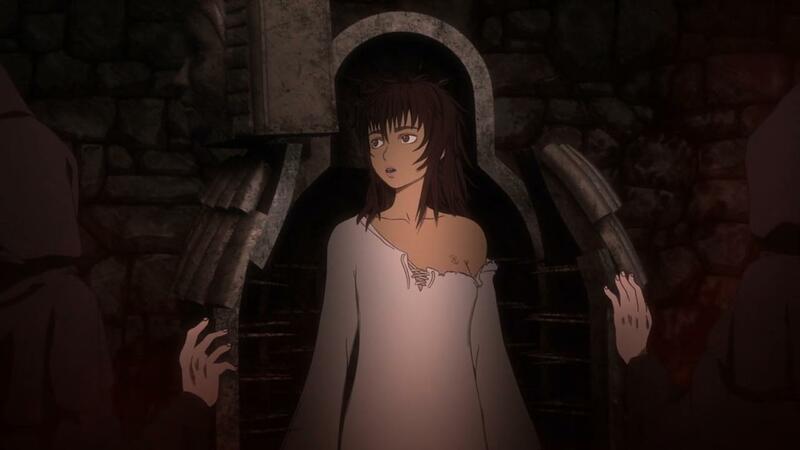 The scene in question, happens when Casca is brought into the torture chamber, as a “witch” that is the head of the heretics. 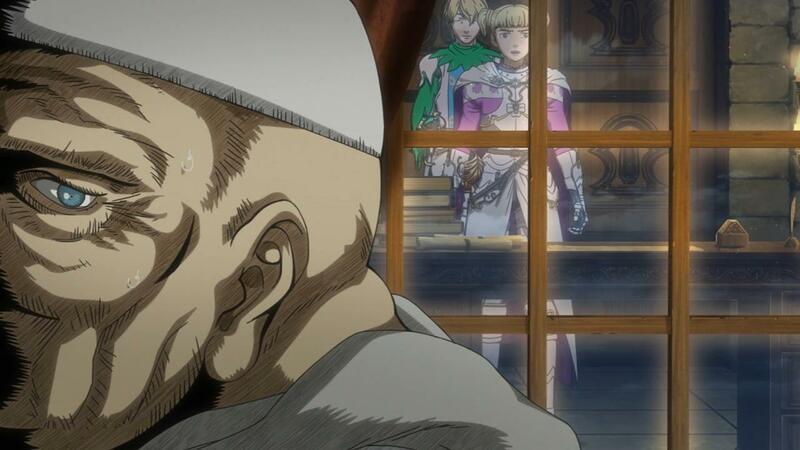 Everyone from the Holy See decides that the best way to end it all, is to basically start putting wholes in this mentally handicapped girl. 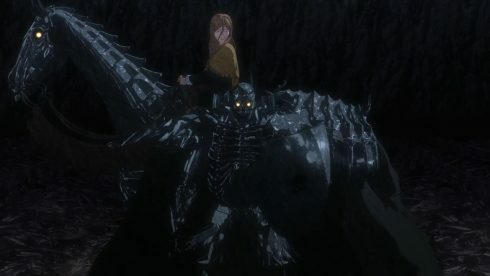 So… When Casca is about to be killed via Iron maiden, its the monsters and the odd little creature/monster that we’ve been seeing protecting her, that clash. 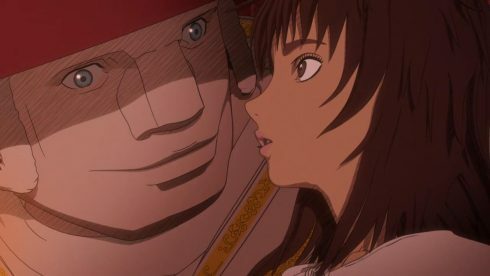 Casca doesn’t die here, but even with Puck’s timely intervention, she’s taken in by the monster blob that appears and whisked away. Everyone else, has to leave the room as the blog itself begins expanding and killing every person it touches. Its all exciting stuff, because we definitely have this moment where Casca seems like she’s in trouble and at the mercy of the High Inquistor, but then both Puck and the monsters appear in the nick of time. 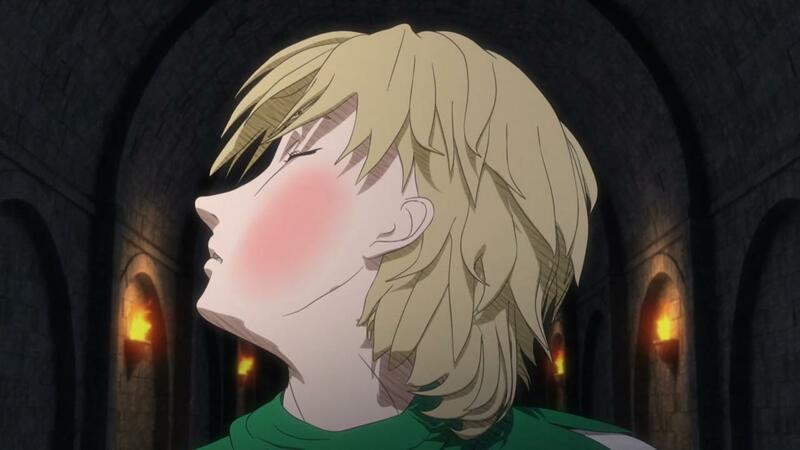 On top of all of that, you have a B-Plot running regarding Nina, Luca and Ishidoro. 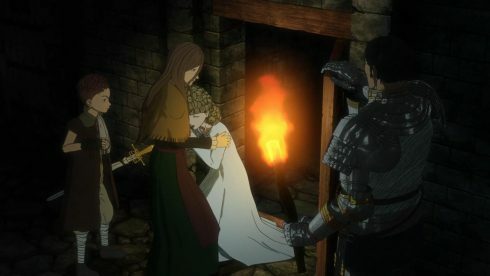 While Guts runs on ahead and finds Farnese to guide him, Luca ends up connecting with Jerome (the soldier that is quite taken with her) and ends up rescuing Nina with his and Ishidoro’s help. Which of course, brings us back to Nina’s story. Nina’s really starting to become a deplorable character, and her redemption seems to be getting more and more impossible by the minute. She’s a weak-willed person, that doesn’t care for anyone but herself, when it really comes down to it. While she’s surrounded by nice and selfless people like Luca, Ishidoro and Jerome, there’s little to no change in her. Even when she basically betrays Casca in order to save herself, there is no actual change in her being, or the way she goes about doing things. There’s a repentance and a self loathing sure, but it almost feels like self-pity rather than actual disdain for one’s self. Nina is just a very selfish person and a complete coward on top of that. 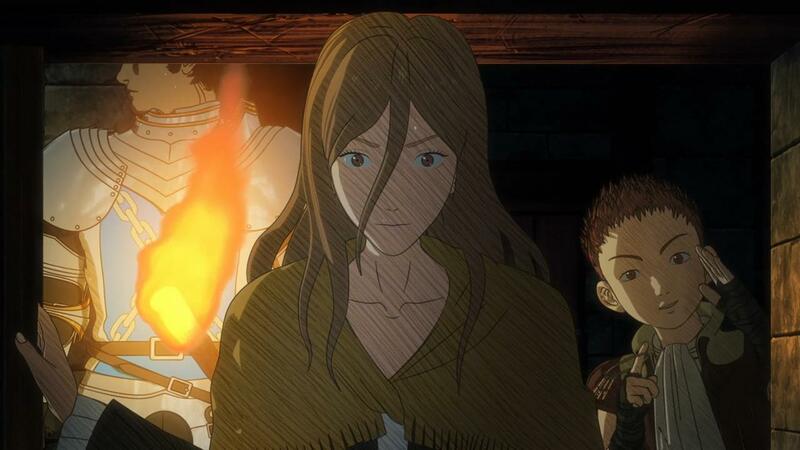 Which, despite how annoying she may be, is a nice contrast to characters like Luca, Ishidoro and even Jerome. Its in the next few scenes, that this really comes into play. 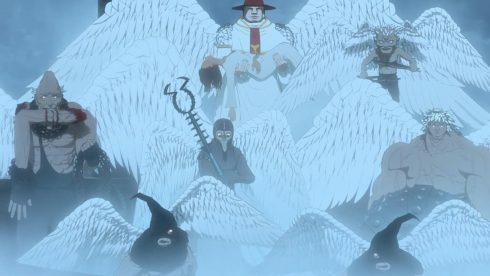 We have Luca, Nina and the rest run into The High Inquistor and Casca, just as a demon seemingly grants the “holy men” these otherworldly powers. 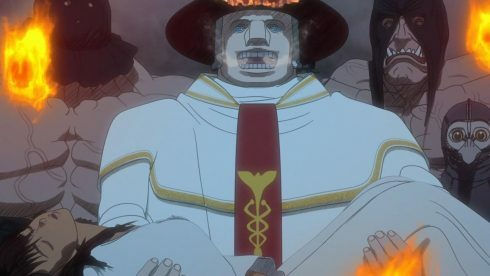 The High Inquistor obviously looks at this as some kind of miracle, and intends to burn Casca at the stake after he releases her from the demon blob horde with his new found fire powers. Of course, Luca, Jerome and Ishidoro hardly stand for that. Which, by the way, the fact that Jerome is even here, is pretty darn noteworthy. 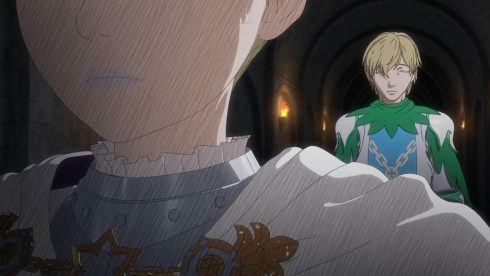 Sure he’s interested in Luca, but there is an inherent goodness in how he basically fights a losing battle with a bunch of monsters, instead of calling for Luca to abandon Casca and leave. Simply put, despite the rather limited amount of screen-time, Jerome has been established as a likable character. Now… While Jerome and the rest may be intending to resist, it hardly works out for them as the newly overpowered torturers now just fling entire stone pillars at them. 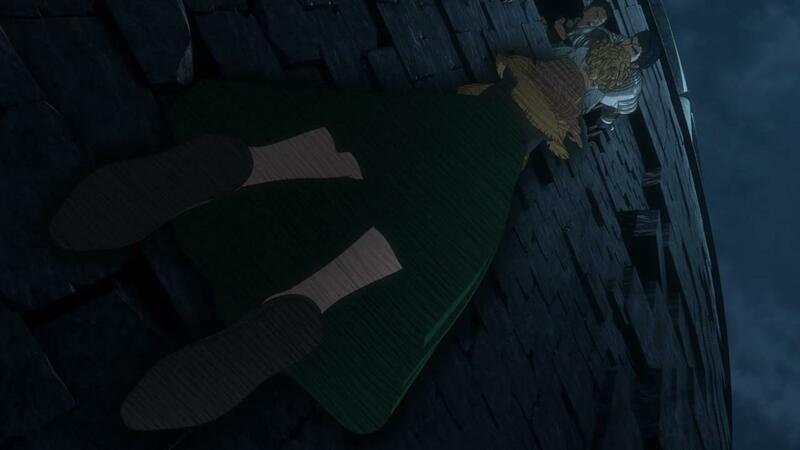 This leads us to Nina’s latest definitive moment, where she basically grabs Luca as both of them are about to fall. Its just so powerful, to see Nina actually contemplating dropping her savior Luca in order to save herself, only to have Luca herself voluntarily let go. And I found myself, really really shouting at Nina when this all happened. “Don’t you DARE let go!” were the words that I kept on repeating, rather audibly at the screen. And then it really did seems like it was all over for Luca, as she herself let go and dropped down to her impending doom. 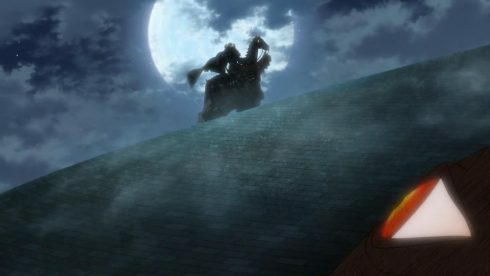 Of course, only moments earlier, the show shows off the Skeleton Horseman on the roof of the tower, and he basically dives down and saves her at the last moment. Which again, makes this whole situation doubly interesting. While there’s the whole event happening at the top of the Tower, The Horseman and Luca are now at the bottom, dealing with something else entirely. It also, of course, isolates the Horseman away from the major problems at the top of the Tower, which basically means that Guts is on his own when he gets there. Speaking of which, in what’s become a welcome pattern for this series, Guts makes another “in the nick of time” appearance at the top of the tower soon after. And its here, that we really get some awesome looking visuals. The fire effects from the High Inquistor and his laceys, the angelic wings, it all just looks jaw dropping. The action and fight scenes themselves that happen here, are pretty darn fun to watch too. Again, there’s this emphasis on slow motion shots, but it all os at least easy to comprehend and feels well choreographed. The only missing element is the smooth and well articulated transitions between each frame, but we have what we have here. 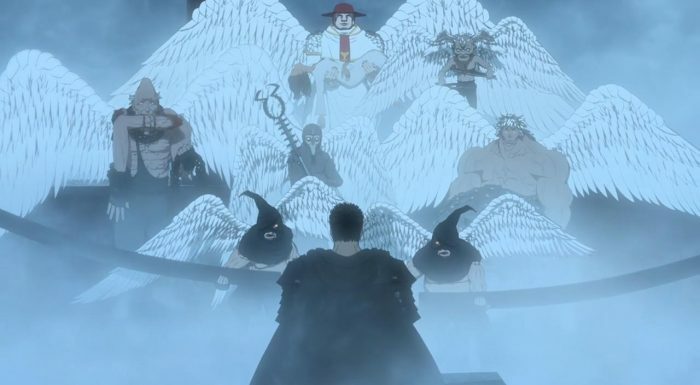 The story itself is engaging, and now we’re at the title moment where Guts is basically taking on Seven Humans turned monsters, all by himself. 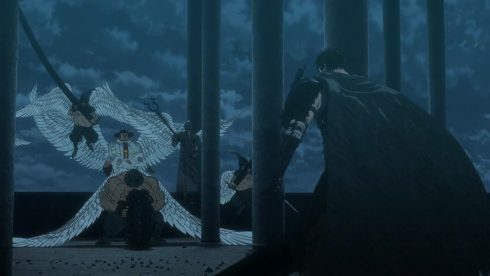 Its here, that the episode ends, with Guts basically outnumbered, outmatched, and clearly having a tough fight ahead of himself. 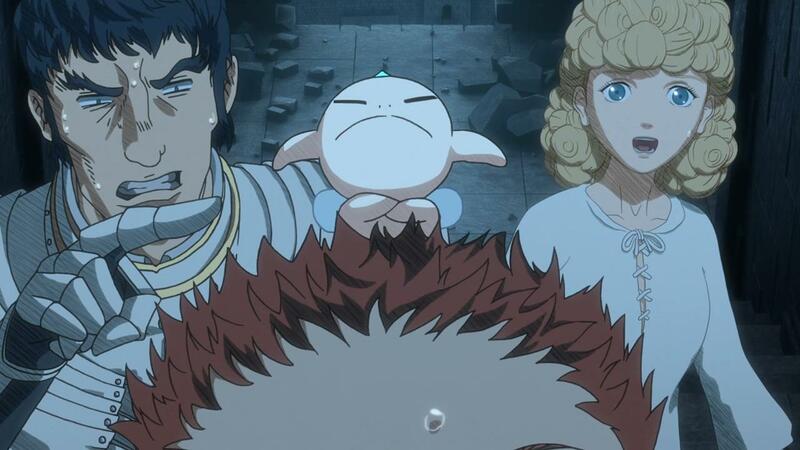 We’ve got everyone from Puck, to Ishidoro, to Nina, to even Farnese in the peanut gallery, and we’re at a point where its all just so exciting. 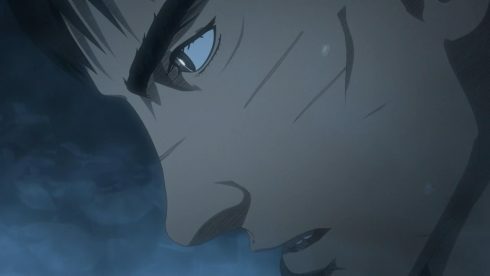 The cliffhanger we have here is brutal, and it definitely made me want to see the next episode ASAP. 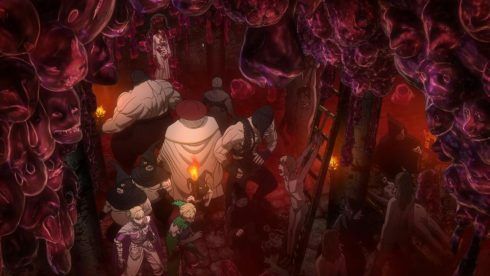 And That’s something that Berserk hasn’t accomplished thus far. It hasn’t made me feel like I NEEDED to watch the next episode. Its been good, its been solid, but I’ve never been quite as invested as I was this week. Which, for this series, is an exceptional achievement. And Personally, I’m just glad that I am finding more and more reasons to praise this series, and give it a pass for its shortcomings. You have to be something truly special, to have people look past your flaws and appreciate your strengths. Berserk’s 2016 anime series, is proving to be that kind of special.